I have Filezilla running on windows server 2008 but I can't figure out how to allow uploads. I'm getting a permission denied or can't access file error. 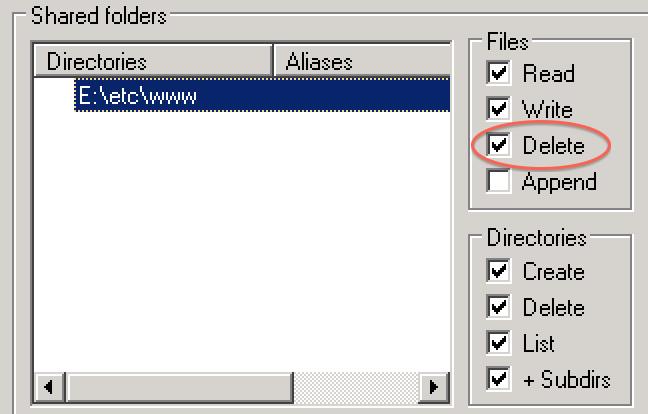 How can I give Filezilla access to the upload directory? (000611)15/09/2014 08:48:26 - cduve (10.100.3.61)> 257 "/" is current directory. (000611)15/09/2014 08:48:26 - cduve (10.100.3.61)> 250 CWD successful. "/dataportal" is current directory. (000611)15/09/2014 08:48:29 - cduve (10.100.3.61)> 150 Opening data channel for directory listing of "/dataportal"
(000611)15/09/2014 08:48:29 - cduve (10.100.3.61)> 226 Successfully transferred "/dataportal"
(000611)15/09/2014 08:48:57 - cduve (10.100.3.61)> 150 Opening data channel for directory listing of "/dataportal"
(000611)15/09/2014 08:48:57 - cduve (10.100.3.61)> 226 Successfully transferred "/dataportal"
(000611)15/09/2014 08:49:00 - cduve (10.100.3.61)> 150 Opening data channel for file upload to server of "/dataportal/configuration.php"
(000611)15/09/2014 08:49:00 - cduve (10.100.3.61)> 550 can't access file. (000611)15/09/2014 08:49:31 - cduve (10.100.3.61)> disconnected. I suspect that you have Filezilla set up fine, based upon the logs you showed, and the issue is actually a directory or file permission issue. Depending on the situation (meaning if this is safe to do or not), easiest way to test is to set the destination directory's (the one on the server) sharing and security to 'everyone' and then try again. Not the answer you're looking for? Browse other questions tagged ftp file-permissions windows-server-2008-r2 filezilla or ask your own question. My ftp account does not show up in filezilla?